Are you ready for more protests? 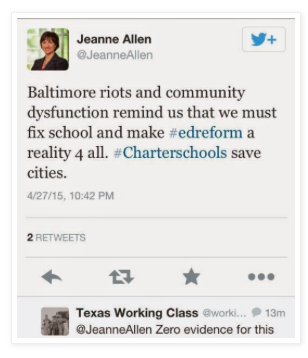 School “reformers” have argued that the Baltimore uprising is a call for more market-based education. I argue the opposite is actually true. The death of Freddie Gray while in police custody is a national tragedy. We support his family and the millions nationwide who call for justice in his case. We support the thousands who have peacefully joined protests for justice. The national media coverage of the Baltimore uprising continues to sensationalize the violent responses of some of those protesting while ignoring the thousands of people across the country peacefully gathering to demand an end to violence inflicted upon our communities. We will watch intently the outcome of the charges filed yesterday against six police officers allegedly involved in the death of Freddie Gray. However, the pursuit of justice must not be isolated to this single case. Cries for justice should not only surround Gray’s killing, but also include many people of color who are disproportionately targeted, arrested, and killed by police across the nation. We also seek justice and fairness for millions of students who are subject to inequitable treatment in our nation’s schools. At the Network for Public Education, we fight for strong public schools and the right of all students, current and future, to receive a quality education. Notably, across the United States, there are educators implementing restorative justice practices in schools to build affinity and de-escalate tensions before they lead to additional violence and a school-to-prison pipeline. Schools often exacerbate the criminalization and dehumanization of our youth, but they can and must be part of the solution. At our recent national conference, many spoke on the need for communities of color and education organizations to coalesce to fight for social justice. Some spoke on the need for us to address racial injustice and inequities more directly. We encourage our members and educators everywhere to teach, discuss and learn with and from our students about these issues. We stand with the people of Baltimore crying out for a nation to see their pain from persisting injustice and inequality. We stand with the students of Baltimore who live in a school system inequitably funded and resourced, who have expressed to the nation that they feel oppressed and ignored. Are you aware that students have been protesting/uprising/rioting against unregulated market-based education over the past several years? The ongoing protest is called the Chilean Winter. Not surprisingly, CNN, FoxNews, MSNBC and other US-based network media doesn’t cover the ongoing student protests/uprising/riots in response to a failing market-based education system in Chile. The students have demanded more training for teachers, less privatization and more government regulation of schools. Are student uprisings across the United States our market-based education future? Here are videos of 2014 Chilean student protest from my YouTube feed that UT-Austin students took while conducting research in Chile on vouchers. My research concurs with the students. Market-based policies foment segregation and help the few at the expense of the many. I have discussed the failures of markets, specifically vouchers, in the research literature on vouchers in the US and in Chile. We also published a peer reviewed paper on the segregation and ill effects of a universal vouchers system last year in the journal of Educational Policy Analysis Archives. I profiled the paper in the post New Research: Vouchers Increase Segregation and Offer Benefits to the Few. A second paper examining market-based education reforms is forthcoming in another peer-reviewed journal. When it’s published, I will release it here at Cloaking Inequity. Not everything is a competition, not everything should be designed as a competition, and education – especially – should not be treated as a competition where there are guaranteed winners and losers. No one should lose in education. Education is a public necessity that calls for collaboration; the sharing of resources, information and practices; and justice. It should be the job of a healthy state aiming for the common good, not a game for businesses with a focus on profits, losses, and hedging financial bets. If school “choice” supporters get their wish for an unregulated market for schools in the United States— I believe we will likely see more student uprisings. Why? After 30 years of market-based policies, that is what is happening in Chile— students have protested (often violently) the glaring inequities in their system. 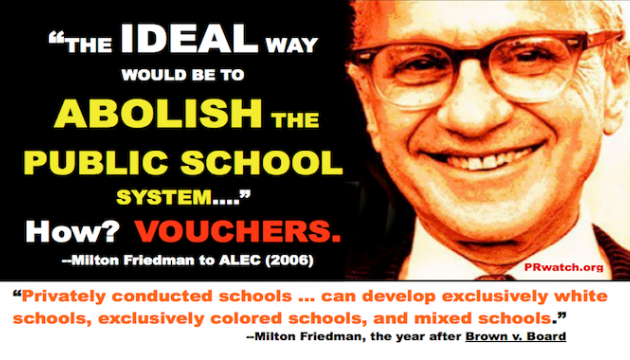 Supporters of school “choice” want you to believe that school vouchers and charters “work” and promote civil rights. I wrote in the post Billionaires co-opt minority groups into campaign for education reform that the reality is just the opposite. p.s. Considering the success of the Newark Student Union, the Chilean student protest et al. My latest project is a new one-day social justice and media workshop for high school students. I will pilot the workshop on May 17 here in California for a group of students from a national civil rights organization. Huntington Beach riots http://t.co/qNLLpYsgBd Where is @CNN?!? @FoxNews?! What we are experiencing today is not “free market” based and therein lies the problem. If it were truly free market enterprise and these cronies were using their own private capital to create these “opportunities” and “options,” it would be true competition and market driven. Handing people public funds that have bought out legislators has nothing to do with being market based. It is simply a now legalized form of fraud. We might learn more from the failed Chilean experiment in market-based reforms, if it was a cheesy reality show.